New simple and clean Resume Templates are best for any opportunity and help you to get your job. These minimal resume templates are professionally organized and labeled so you can be confident in getting the best results in the fast possible time. All templates are perfect for photographers, designers, and developers with easy to customize fully Photoshop layered PSD files. 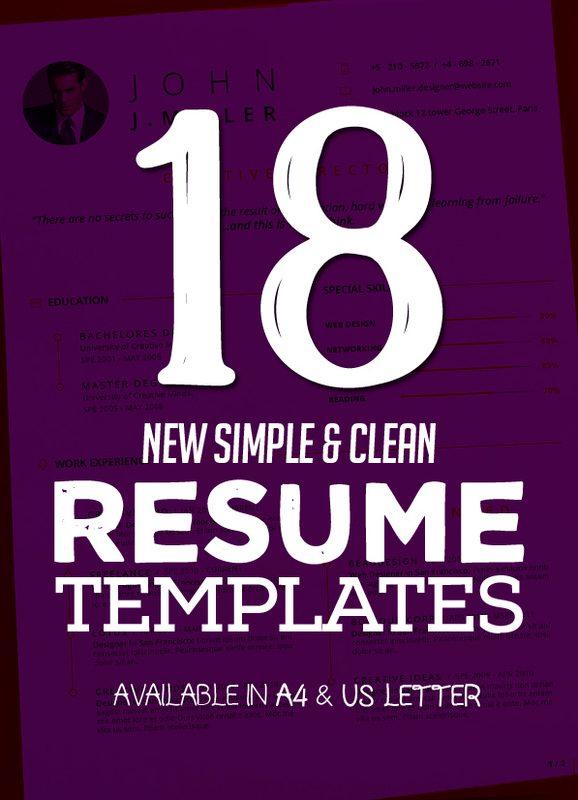 Remember your first impression starts with your Resume / CV, make it look perfect, with these clean resume templates. 2 Pages + Cover Letter and lots of icons available in ( Ai, Eps, Png ). Simple resume templates download package included INDD , IDML and DOCX files. And reference of Free fonts used in these resume. Simple and Clean Resume cv template to help you land that great job. The flexible page designs are easy to use and customise, so you can quickly tailor-make your resume for any opportunity. Features are A4 size (210×297mm) + 3 mm bleed, Main 2 Page (Resume + Cover letter), MS Word .docx/doc file added, Quick and easy to customise templates with Perfectly Aligned Typography. Professional & Clean Resume/CV Word Template. Elegant page designs are easy to use and customize, so you can quickly tailor-make your resume for any opportunity and help you to get your job. Features: Professional and clean structured files with Well organized layers and layer groups, 300 DPI(Dot per inch) resolution & CMYK color mode and Fully Editable in PSD, AI & Ms Word. Profesional Resume Template for Word Instant Download CV Template US Letter and A4 Templates included PC Compatible using Microsoft Word! 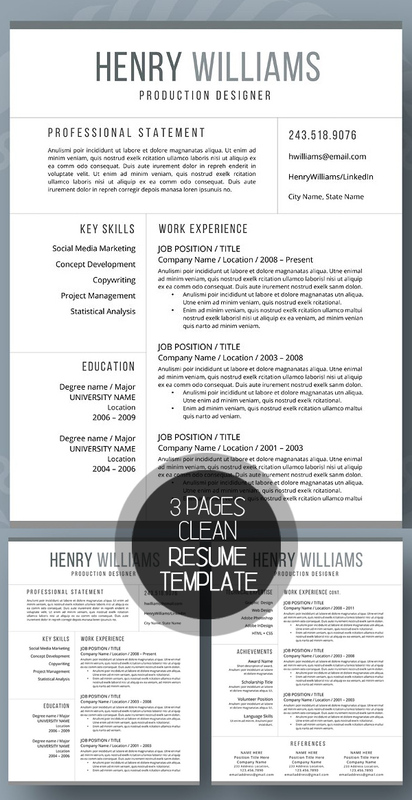 This Pro resume template is just what you need to freshen up that old resume! Creative and stylish while still being professional, you’re guaranteed to stand out with this CV template. The design is customizable, so you can easily modify it, you can simply replace the filler text with your own information and add your own photo. These Clean, elegant and professional resume/Cv templates were carefully designed to help you make the best First Impression at your next job Interview. High-quality, professional templates that are unique in creativity and help you to get your dream job. All of our resume template’s come in DOCX and PSD format with extra icons in PNG files. An awesome Resume/CV Template with fresh and modern look. It includes double pages, easy to use and customize for any opportunity and help you to get your job. This is the fast and flexible solution for anyone looking for a simple and professional resume. Professionally designed templates are easily customizable, you can update the colors, fonts, headings and layout to create a piece that’s uniquely your own. No advanced design skills are necessary. This professional resume will help you stand out ! The package includes a resume template and cover letter template in a pretty theme. This template is easy to change colours, layout and fonts to suit your needs. It works in Microsoft Word , Powerpoint , Adobe Illustrator and Adobe Photoshop. Quality and thoughtful designs, that will help you build professional and memorable presence. Our resumes are well-crafted and timeless, you can easily adjust them according to your needs and use for years. The perfect way to make the best impression. Strong typographic structure and very easy to use and customise. The resume have a very organized and named layers, really easy to customize & available in A4 and business card psd template.